Episode 1 : "Ring Dem Bells"
Episode 2 : "When You've Got To Go"
Pike receives his call up papers, goes for his medical and passes it, despite his various ailments. There is a blood donor session at the church hall and Mainwaring challenges Warden Hodges to see who can donate the most pints of blood. All seems to be lost until Jones turns up with 17 nuns and 80 Italian P.O.W. 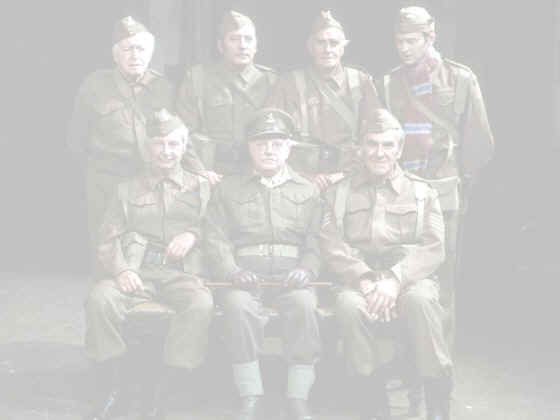 It also turns out that Pike has a rare blood group, so he doesn't have to join up, he tells the Platoon, but not until he has had his "farewell" supper of fish and chips, washed down with raspberryade. Episode 3 : "Is There Honey Still For Tea?" Godfrey is distraught to find that his beloved Cherry Tree Cottage is to be demolished to make way for a new aerodrome. Surprisingly it is Fraser who saves the day by blackmailing the minister in charge of the aerodrome and it is to be built elsewhere...about 200 yards away. Episode 4 : "Come In, Your Time Is Up"
The platoon are given 2 new tents and go camping next to a small lake. Hodges turns up, after giving the Verger, the Vicar and a group of scouts a lift who are also camping there. His van is out of petrol, so he has to sleep overnight in it. During the night Fraser sees a German plane on fire. The next day it appears that the German crew bailed out and are on the lake in an inflatable dinghy, but refuse to come to shore. The platoon try to capture them but their raft starts to sink. Pike saves the day with a bow and arrow. Episode 5 : "High Finance"
Mainwaring discovers that Jones's bank account is in the red and aims to discover why. They go through the butchers books and it so happens that the orphanage haven't paid their bills for 3 months, but Jones can't bring himself to ask for payment. They also discover a chain of debt, which all leads to the Warden. Episode 6 : "The Face On The Poster"
Mainwaring plans a recruitment drive, and wants a poster to encourage people to apply. Jones is picked as the one to appear on it. Unfortunately, there is a mix up at the printers and Jones's picture ends up on a missing POW poster. Jones is arrested and thrown in a POW, and so is the rest of the platoon when Mainwaring tries to help! "The Love Of Three Oranges"
The Vicar is organising a church bazaar in aid of the Comforts for the Troops Fund, and Mainwaring has elected himself as Chairman, much to the annoyance of Warden Hodges. All the platoon donate items, such as Jones's monster brawn and Mrs Mainwaring donates some of her homemade weird lampshades, but she doesn't show up due to an argument with Mainwaring earlier. Hodges donates 3 oranges, which are very scarce in wartime. Mainwaring is determined to get one of these to make the peace with his wife, and after bidding against Pike gets one. But the orange isn't quite what he expected.